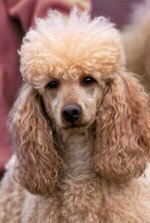 One of the most evident dog characteristics of the poodle is that he is very intelligent. He's also energetic, active, personable, confident, has a great sense of humor and likes to have fun. Poodle characteristics also include alertness and inquisitiveness. They're quick learners, love to learn new things and easily trainable. They're good show dogs as they like to strut around the ring with their heads held high. Circuses love them as they train quickly and have a regal and fun loving air while performing. One of their dog characteristics is that they love to do things. Train her to put dirty laundry on the floor into the laundry basket. Teach him to pick up his toys and put them back in his toy box when he's done playing. They want to please you and like to help out! Standards like doing things, miniatures love playing and being active, and toys are lap dogs who are active and fun in a small package! Another one of their dog characteristics is they love to learn - so teach them tricks, or about anything! throughout their lives. As far as dog temperaments, all poodles are very protective of their families and even the littlest toy will put on a big dog act and bark ferociously to protect her home from what she perceives as intruders. Sometimes it's the littlest dogs who have the biggest mouths because they don't realize how little they are! Holly was very protective of our home and outside property. One day, we were out with the next door neighbors who had a miniature poodle. He came in our front yard and approached Holly, our toy poodle, with a happy look on his face but Holly wanted no part of him. She growled at him which seemed to take him by surprise but he still approached. When he got in her space, she lunged at him barking, growling and ready to pounce! The poor dog got this look of fright on his face and went running onto his porch to hide! It was pretty amusing! Poodles get a bad rap as being "snooty" but they're really not! Another one of their dog characteristics - they have a regal air about them when they run and walk with their heads held high but it's just their style! With their heads and tails held high, this gives a regal, not snobby, air! Holly was potty trained in a short period of time. I was able to teach her commands - sit, shake hands, lay down, and roll over very quickly. I taught her how to play hide and seek on the first try; she loved to have fun and play and caught on very quickly! She was always amusing us with her antics; she loved to make us laugh! Poodles adapt to their surroundings quickly to become part of the pack. They're eager to discover things in their environment. Holly loved walks around the neighborhood and discovering everything along the way. 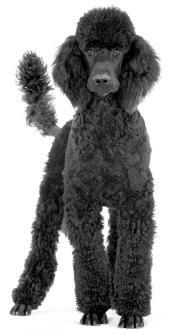 Poodles also love to notice and observe - people, other animals, and things in their environment. They're very inquisitive. Holly spent hours in the yard watching cars go by, people go by and other animals go by. Like other dogs, poodles love to go for rides in the car. Holly would stick her head out the window, ears blowing, as we drove along. They also love excitement - you can see it in their faces. It's like their eyes light up, and they get an excited, almost smiling look on their faces when they are doing, or about to do, something they love. Their dog characteristics are many! 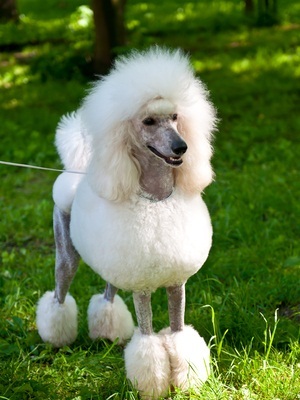 Poodles are a rare mix of intelligence, love, fun and possess great senses of humor. When they find an action makes you laugh, they will repeat it. Enjoy your poodle and her great personality.